This post updates our previus post in support of Canadian computer programmer Saeed Malekpour. His death sentence is believed to be imminent. To stop the regime from executing Saeed, it is essential to draw as much attention to him as possible. Please ask WIRED magazine to cover his case, and write to your Secretary of State or Foreign Minister to demand their intervention (addresses and sample letters below). 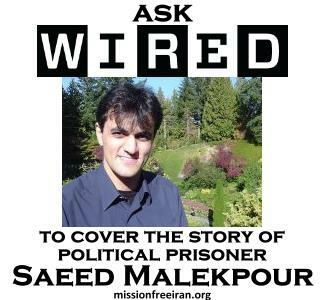 We have written to WIRED magazine to ask them to cover the story of Saeed Malekpour, as well as the state of repression for those who communicate digitally, including bloggers and Facebook users. Saeed’s colleagues around the world should raise their voices in defense of him and others whose work in the online world has landed them in the torture houses of the Islamic Republic. Getting coverage in a popular mainstream technology magazine that also covers social issues raises Saeed’s profile, as well as those of all political prisoners in Iran. I am writing to bring to your attention the time-critical case of Saeed Malekpour, a Canadian resident and software programmer who is at high risk of execution because of his (entirely legal) programming work. Saeed was arrested by the Islamic Republic when he returned to Iran to be with his dying father in October of 2008. He has been held as a political prisoner, under torture, since that time. He has been charged with being involved in “internet offenses,” including “taking action against national security by designing and moderating adult content websites,” “agitation against the regime,” “contact with foreign entities,” “insulting the sanctity of Islam,” and “insulting the Supreme Leader and President.” All of these are politically motivated charges; Saeed has done nothing illegal. Some of his charges carry the death penalty. His final trial lasted 7 minutes. We have learned as of December 5 that he is to be executed by the Islamic Republic of Iran for doing his job as a computer programmer. You should be aware that the Islamic Republic is currently in the process of conducting widespread executions and torture of Iranian people in its effort to fully extinguish the ongoing revolutionary sentiment in Iran. Saeed Malekpour is one of many who are being sacrificed to this end. We are asking Saeed’s professional colleagues worldwide to speak out in his defense and demand his immediate and unconditional release. Those outside of Iran are the only ones capable at this moment in time of raising our voices to demand an end to human rights atrocities that are ongoing in Iran against everyday people. We have asked lawyers worldwide to stand up and speak out for the human rights lawyers who have one by one been put behind bars in Iran, and now we ask the computing world to raise their collective voice against the persecution of their colleagues like Saeed Malekpour, not to mention the hundreds who have been imprisoned, tortured, and sometimes executed for their use of the radical digital technology known as “the blog.” Hanieh Shotorban is one young woman who has been arrested, imprisoned, and not heard from again for using Facebook. We hope that you will consider writing a story about Saeed and asking your readership to engage in a simple action to support him – anything from writing a letter to the UN on his behalf, to engaging in other creative actions that are in the purview of your profession. Additional background on his story can be found at the below links. Please feel free to be in touch with any questions. IN ADDITION, PLEASE WRITE A BRIEF NOTE TO YOUR FOREIGN MINISTER OR SECRETARY OF STATE. A brief sample letter is below, followed by the relevant list of addresses. I request that you urgently demand that the Islamic Republic of Iran release Canadian resident and political prisoner Saeed Malekpour. Saeed is a computer programmer who has been held under torture as a political prisoner in the prisons of the Islamic regime in Iran for the past several years. As you know, the Islamic Republic is currently in the process of conducting widespread executions and torture of Iranian people in its effort to fully extinguish the ongoing revolutionary sentiment in Iran. Saeed Malekpour is one of many who are being sacrificed to this end. Saeed’s execution is now believed to be imminent. I urge you to do your utmost to pressure the Islamic Republic to free this young man.